Another overnight oats recipe. YES. YES. YES. Safe to say, PB Chocolate Chip Overnight Oats have been helping a girl out. A WHOLE lot. As I complete the last little stretch of prerequisites needed before I start nursing school (eeeeeek!!!! ), I’ve just accepted that my mornings from here on out are gonna be a little more hectic than I would have dreamed. However, I literally wouldn’t change it for the world because if bare minimal sleep means that in the near future I’ll be a pediatric nurse practitioner, improving children’s lives then COUNT ME IN. No sleep team over here, hollaaaaaa. Y’all, I’m seriously SO excited the more that I think about my future. I know that there is still quite a while to go but that’s not holding me back from obnoxiously shrieking in excitement every chance I get. It’s like all of the hard work and the endless emotionally unstable trips to Starbucks will all pay off one day and I JUST CAN’T WAIT! But enough about me and back to these mason jars of overnight YUM. For anyone that hasn’t had a chance to try out overnight oats, I HIGHLY recommend them. They are so convenient, super customizable and fit perfectly into those hectic weeks where even a slice of toast is simply too time consuming. Oh and of course, once again I had to bust out my all time low-cal fave: PB Fit Powder. I honestly can’t rave enough about this wonderful substitution that has been a loyal lifesaver for a peanut butter lover like myself. To make things look a little “fancy schmancy”, I prepared the chocolate and peanut butter portions separately and then layered them the next day. However; if you wish to just mix all of the ingredients together the night before, you’ll still have a mason jar of chocolaty, peanut buttery greatness all the same! *Disclaimer: I am not affiliated with or sponsored by any of the products listed in this post. All statements are my own, unbiased opinions. In a mason jar or seal-able container, add all of the ingredients required for the PB portion. Seal the container and shake thoroughly to ensure that all of the ingredients are mixed well. In a separate container, repeat steps for the chocolate portion, leaving out chocolate chips. Refrigerate both containers for at least 4 hours of better yet, overnight. This will allow the oats to really soak up the almond milk and soften up. 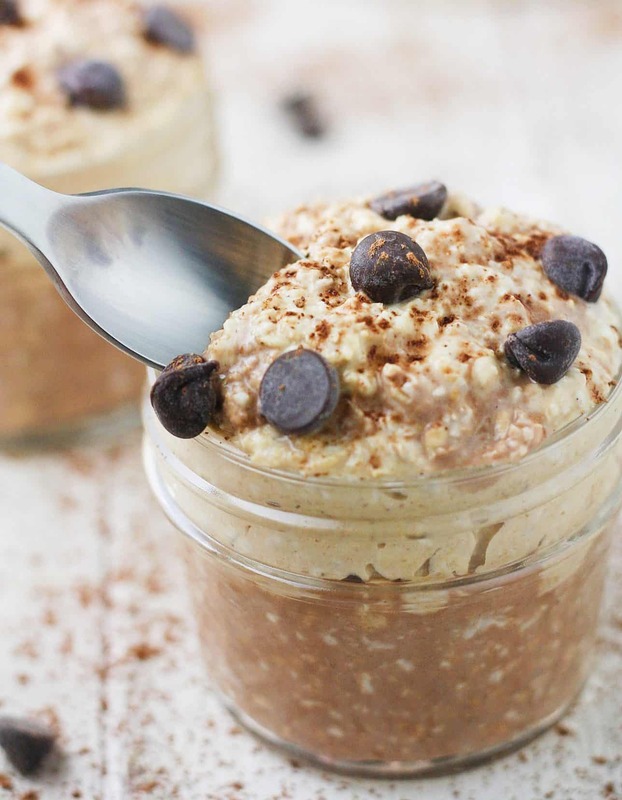 Get two bowls or smaller mason jars and add half of the chocolate oats, then half of the PB oats to each. Top with chocolate chips and enjoy! To save time (and mason jars), you can also combine all of the ingredients for the PB and chocolate portions together before refrigerating. Then top with the chocolate chips the following morning. It will still be just as yummy! PB and chocolate are the glue holding me together this semester girl!